So I have been received a lot of quests for the Queen Walk DragLaLoon strategy lately, which can be used when you don’t have the King and want to obtain at least 2 stars in Clan Wars! I have seen a lot of players using Queen Walk but not with DragLaLoon. A big thank to WingedBrew for sharing this guide to us! I have been getting a lot of stars with this strategy in Clan Wars while my Barbarian King is being upgraded. 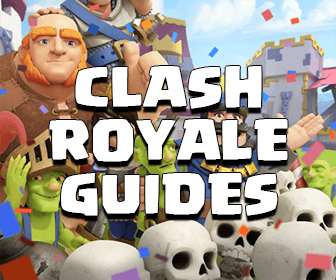 Although this guide is going to mainly focus on Town Hall 10 but obviously Town Hall 9 and 11 players can use this strategy as well. 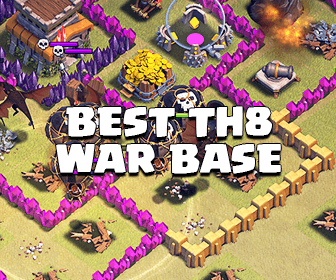 That’s great If TH10 players can use this strategy and make the most use of it by attacking Town Hall 11 bases with ease. This is not an 3 star strategy, this is a solid 2 star strategy! Level 5 Dragons and at least level 30 Queen is strongly recommended. When should I use this strategy? 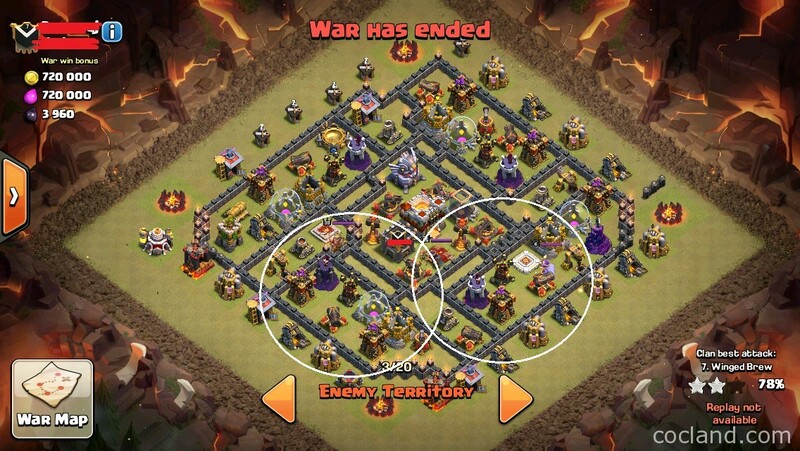 You can use this strategy to attack bases that have all 4 Air Defenses away from the Town Hall. The main idea is that you take down 1-2 Air Defenses with your Queen Walk and let your Lava Hounds soak damage from the left ones, protect Dragons and Balloons. Make sure the left Air Defenses can’t target your Dragon when they are attacking the Town Hall! Never use this strategy against 2 single-targeting Inferno Tower. If there is just 1 single-targeting Inferno Tower, you can use Freeze Spells to deal with it. Don’t use this strategy If your Archer Queen can’t take out any Air Defense. Ideally If you can get 15%+ with her ability and 1 Rage Spell. Truly Sweepers are not a big deal but sometimes you should use your Rage/Haste wisely to counter them. Your Dragons can kill the enemy Archer Queen quickly when get boosted by Rage so you don’t need to care about her. If she is exposed, you can kill her with your Queen Walk. Lava Hound/Balloons/Golem/Giants/Valkyries: Make sure your Archer Queen doesn’t lure them out. Dragon: Your Dragons under Rage can kill it immediately. Witches/Archers/Minions: Trust me, you will really hate these CC compositions as they can really mess things up. You will want to replace 1 Haste for the Poison Spell to get rid of them as soon as possible. As you can easily see, 2 Air Defenses at the bottom can’t hit your Dragons if they attack the Town Hall from the North. If you place them properly, you can take the Town Hall out without any problem. Drop Archer Queen followed by Healers. You will need to use 1 Rage and her Ability to keep her alive as long as possible. All buildings masked as the yellow X mask will be destroyed by the Archer Queen. 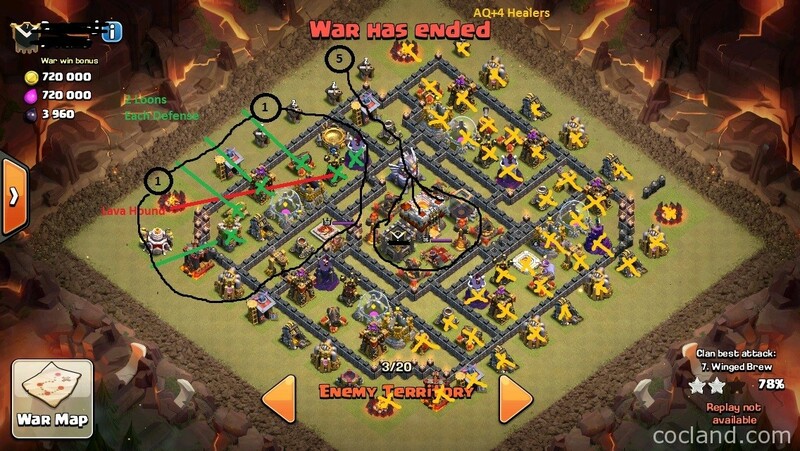 Once the Air Defends are destroyed, place your Lava Hounds down (The red line). Once the defensive buildings nearby get locked on to the Lava Hound, send 2 Balloons on each defense. Place your Hastes down so your Balloons can get there faster. 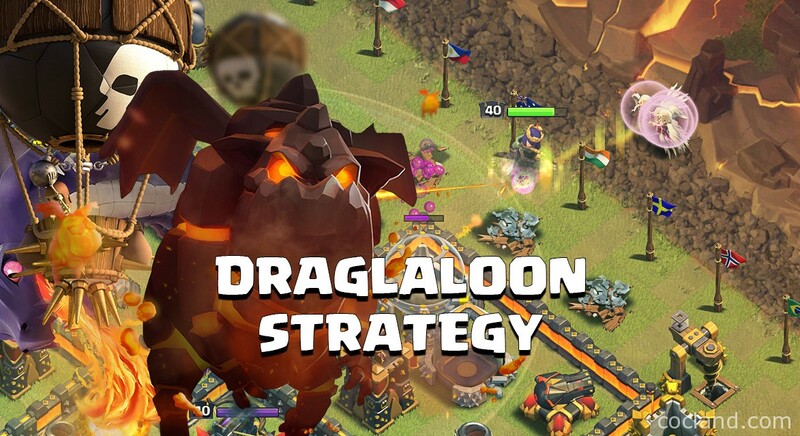 Drop 2 Dragons behind your Balloons to create a funnel for the remaining Dragons (2 black circles). Drop the rest of your Dragons so just can just move and get the Town Hall inside. Use your remaining Rage Spells for your 5 Dragons. Drop the Freeze Spells on the core. Okay guys so that’s it! Very simple right? I hope you can get a lot of easy stars with this strategy, especially Town Hall 9 and 10 players. Don’t hesitate to ask me any questions guys!